The Festival of the May Queen Tapestry celebrates a revered rite of spring at Cranbrook. 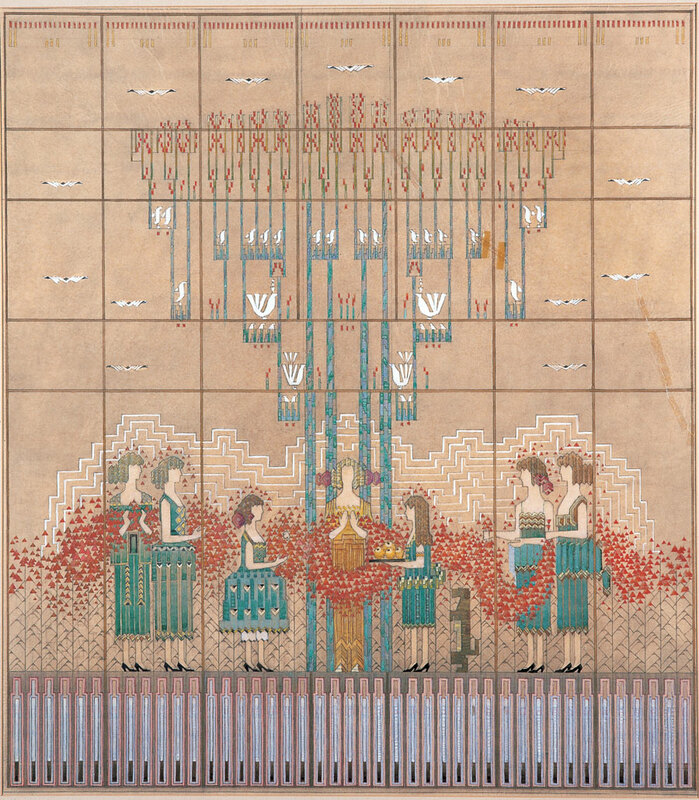 The May Queen stands beneath a highly stylized tree filled with white birds and receives edible tribute from a handmaid while the Queen’s attendants wrap her in a red garland. Designed by Loja and Eliel Saarinen together, it emphasizes the harmonious relationship between human social activity and burgeoning nature in this season of renewal. The elements of queen, court, pet, fauna and flora provide a charming and apt decoration for Eliel’s splendid dining hall in the original girls’ school at Cranbrook. This watercolor study, prepared in 1932 by Eliel, displays the fully realized content of the richly woven Kingswood Dining Hall tapestry but with a twist: the figures in the watercolor have been reversed in the tapestry—the handmaid with platter serves from the Queen’s right side. Initially, Loja used this watercolor to weave a panel of the girl in pantaloons for a preliminary study. The full tapestry, completed in 1934, still adorns the Kingswood Dining Hall today.